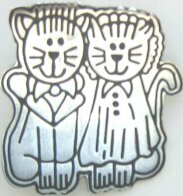 This sterling silver pin features a boy cat and girl cat or a cat bride and groom. The pin is 1 1/2" high x 1 1/4" wide. New. Manufacturer's display sample.